Comrades from DAF join the struggle to defend Kobane. The heroic resistance of the people of Kobane in fighting the onslaught of the Daesh (ISIS) fascists since mid-September, has led to a surge of international solidarity. A multitude of articles and statements have been written and protests have been held in cities across the world. 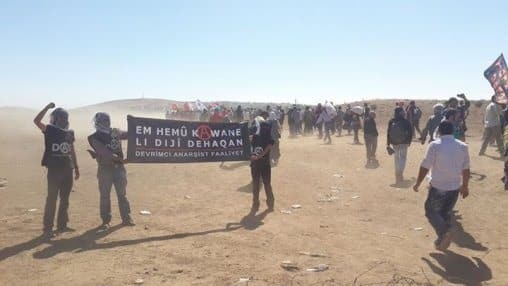 Kurds have flooded across the Turkish border to help their compatriots in the fight despite being brutally pushed back by Turkish forces, and others including Turkish comrades from DAF (Revolutionary Anarchist Action) have gone to the border to support in keeping it open to help the flood of refugees escaping to Turkey. There have been calls to arm Kurdish forces and calls to support DAF and send aid for refugees. Yet this solidarity with Syria’s Kurds has not been extended to non-Kurdish groups in the country that have been fighting, and dying, to rid themselves of fascism and violent repression and for freedom and self-determination. It’s often said incorrectly, that sectarianism lies at the heart of the Syrian conflict. It’s necessary to understand to what extent sectarianism plays a role in our response too. The protest movement that erupted against Bashar Al Assad in 2011 united people across Syria’s diverse ethnic and religious spectrum in a common struggle for freedom. Kobane was no exception. The Kurds who are the majority in the town had long suffered under the Arabization policies of the Baathist regime, and were amongst the first to rise up when the Syrian revolution began. In this protest from mid-2012 Kurds and Arabs in Kobane jointly call for the downfall of the regime and chant in support of the Free Syrian Army, raising the Kurdish flag at a time when this was a dangerous act of defiance. But from its earliest days the Syrian protest movement in Kobane and elsewhere failed to gain international support. Had it done so the country would not have been destroyed to such a degree that ISIS could have taken control of large areas. Over the past three years, relations between Syria’s Arabs and Kurds have been fragile and changeable, subject to both the Assad regime’s manipulation of ethnic divisions, and to the misguided political machinations of opposition politicians from both groups who have put their own interests and agendas above the people’s vision of freedom. Yet, in spite of this activists on the ground have continued to stress the importance of Kurdish-Arab popular unity and to resist ethnic and sectarian divisions. Few international solidarity statements have mirrored these calls. Like their Kurdish compatriots, Free Syrian Army battalions have been resisting Daesh in Kobane with greatly inferior weapons. Whilst Daesh possesses the heavy US weaponary it seized in Iraq, Syrian fighters (both Kurds and Arabs) have only light arms and limited ammunition. Both the YPG and the FSA have been calling on the international community to supply them with heavy weaponary. Supporting the call for weapons to the resistance is imperative to allow the people of the region to defend themselves from annihilation. It also reduces the perceived need for direct military intervention from external powers which operate according to their own agendas, ones diametrically opposed to the interests of the popular struggle. In supporting such calls we should distinguish between 1) support for a broad coalition of local forces against fascism and for a popular struggle which seeks to destroy as much of the old regime as possible, as well as supporting the right of self-defense of all people against mass slaughter (including their right to take arms from wherever they are offered as necessity demands), and 2) support for any political project or group claiming power in the post-revolutionary phase which will necessarily reverse the achievements of the revolution. The later must be resisted. An obvious tension therefore exists between the authoritarianism of the old guard of the PYD which maintains a top down vision, and the thousands of Kurds who believe in, and are trying to realize, radical democracy from below and should be supported in that aim. But the Kurdish region of Syria is not the only place where a social revolution is putting into place radically new ways of organizing, although it has benefited from greater space and stability, relatively speaking when compared with other areas of the country. Experiments in local, autonomous, self organization have been a defining feature of the Syrian revolution, and hundreds of local committees and local councils have been established to administer basic services and coordinate revolutionary activities. Yet these people are not seen to be deserving of international solidarity because they have no leader who has converted to libertarian municipalism. The fact simply is that they have no leader at all and these forms of horizontal organization arose spontaneously from below as a response to the destruction of the State. Furthermore, as the world’s attention focuses on Kobane, struggles elsewhere have failed to gain the media spotlight. In August, the people of Deir Al Zour, mainly from Al-Sheitat tribe, led a brave resistance against Daesh. In the following days, facing the fascists alone, the resistance was almost defeated and some 700 people from the al-Sheitat tribe were executed by Daesh causing little global outrage. But the people of Deir Al Zour didn’t abandon their struggle against the ISIS extremists. In recent weeks the White Shroud (Kufn Al Abyaad) has killed some 100 Daesh fighters through guerrilla style attacks. This secretive popular resistance group is made up of around 300 locals, the majority of whom have never fought before but have taken up what arms they can raise to protect their families and communities from fascist onslaught. As the world focuses on Daesh’s advances in northern Syria, communities elsewhere are continuing to resist the genocidal maniac Bashar Al Assad and his sectarian militias which have increased their assault on liberated areas since US airstrikes freed up the regime’s resources elsewhere. There’s been little solidarity shown with the people of Al Waer district of Homs, the last rebel stronghold in a city which was once the soul of the revolution. Al Waer is home to some 400,000 people, half of them displaced civilians who have fled conflict elsewhere in the country. The area has been under regime siege for months and in the past couple of weeks the Assad regime has intensified its shelling causing a massive humanitarian crisis. Syrian activists’ calls for solidarity with Al Waer have fallen on deaf ears. The question that remains is whether international solidarity for Kobane arises from the Kurdish ethnicity of its defenders (i.e. they’re not Sunni Arabs), from support for the political position of a party (the PYD/PKK), or from the principle that all people have the right to defend themselves from terror, whether in the form of religious or nationalist fascism and to determine for themselves how to organize their lives and communities. If it arises from the latter principle, then the same solidarity extended to the Kurds must be extended to all revolutionary Syrians. This article by Leila Al Shami was published on October 20, 2014 on the blog Leilashrooms. We have hereby republished the article without alterations. The article stresses the need for solidarity with the Syrian popular movement against the regime of Bashar al-Assad and IS alike. No matter if the forces opposing IS respectively the Syrian regime might be Kurdish or Arab (to only name a few) – they all need to be protected from gruesome brutality and mass murder. Singling out one group of resistance presents a huge disservice to the Syrian struggle. In asking for arms, the article does not exactly represent the stance of Adopt a Revolution. Still, the article sheds light on the important fact of uneven solidarity for different movements within the Syrian revolution.